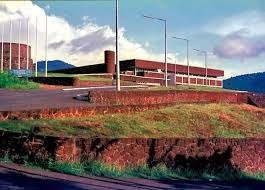 Among contractors that appeared before the Committee hearing held at Tower Hill were Fimnet Benton Villa, Salini, ISU, CRSG TMARC, and Compagnie Sahélienne d’Entreprises (CSE). CSE, headquartered in Dakar, Senegal, has been providing construction services for the past 40 years in Sierra Leone, on projects such as the Freetown-Conakry Highway, Lumley Tokeh Road, Peninsula Highway, and the Hillside Bypass Road, which will improve mobility in Freetown from the center to the Eastern parts of the city. The acting chairperson for the Committee on Works, Housing and Infrastructure Hon. Rosaline J.K. Smith, Member of Parliament for Constituency 103, had fulsome praise for Fimnet Benton Villa. In his presentation to the Committee, Fimnet Benton Villa Country Manager Mohamed Gento Kamara spoke about the work his company has done so far on the King Jimmy Bridge, Hastings Police Training School, and Hill Station road projects. Kamara said his company has completed drainage systems on Hill Cot Road, but were faced with a challenging 1 kilometer extension. Hill Cot Road in the Hill Station area of Freetown’s westside currently has a length of 2.29 kilometers. 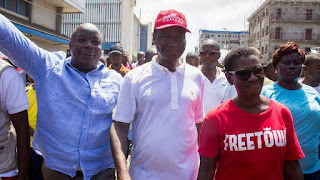 Kamara also said that the culvert under construction in Freetown’s New England will be completed by next week, but work needed to be done by NPA and Guma Valley, utility companies who have potential facilities along the Jomo Kenyatta road. In January 2015, the National Power Authority (NPA) was replaced by two separate bodies, known as the Electricity Generation and Transmission Company (EGCT) and Electricity Distribution and Supply Company (EDSA). Kamara said rehabilitation on King Jimmy Bridge is 90 percent complete, but they have been given additional responsibility to construct steps, which he said should be done by June this year. 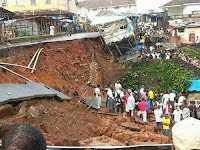 In the early hours of August 2013, King Jimmy Bridge, a colonial structure built during the early 19th century collapsed in a landslide. About six people were confirmed dead at the scene. Hon. Smith called on the Sierra Leone Roads Authority to award more contracts to FIMNET by way of enforcing local content policy. According to Adam Smith International, a U.K. based professional services firm, the Government of Sierra Leone approved its first Local Content Policy in May 2012, in keeping with its aim of reducing the country’s 70 percent poverty rate. This reflected a regional desire to focus on local content development, promoting the transfer of skills to Sierra Leoneans, generate jobs, increase the use of locally produced goods and improve rates of local ownership, Adam Smith said. However, the policy was not perceived to have yet fully benefitted the local economy, not having reached its modest targets of, for example, 20 percent of managerial posts and 50 percent of intermediary positions across all industries being filled by Sierra Leoneans. In contrast to fulsome praise for Fimnet, Hon. Smith wasn’t happy with Guicopres. She said their 5-kilometer road in Kono and Kabala is nothing to write home about. Chairman of the Committee on Works, Housing and Infrastructure, Hon. Komboh Kamara, expressed his frustration with Guicopres promises that were never fulfilled. “When we visited Conakry, we observed that they had the facility and that they are doing good work with projects in Guinea,’’ Hon. Komboh noted. In response, Guicopres Country Manager Alpha Keita told the hearing that delay in payment was the main reason for stalls in the project. ‘’We signed a contract on September 20th, 2013 and received advance payment in April 2014,” Keita said. 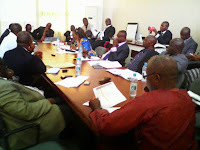 “Despite the fact that the contract advocates 45 days for payments to be made, we go months without receiving payments. We have just received two payments and the first payments took more than five months while the second payments took more than six months and we have to pay workers’’ Keita said. 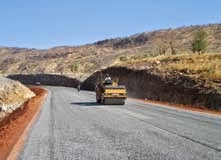 Abdul Aziz Kamara, the acting director general at Sierra Leone Roads Authority, told the Committee that even though payments have been made available the company said completion of the work will likely be in April 2016. Keita said that 65 percent of the total project had been completed but only 28 percent of the total cost of the project had so far been paid. According to the Sierra Leone News Agency (SLENA), prior to Keita signing the contract with the government, he promised to pre-finance the road work but was faced with lots of challenges in accessing loans from a number of banks he approached, SLENA said. Sierra Leone needs donors and investors to finance costly road and bridge work. The government is co-financing projects with its creation of the Road Fund. However, a recent World Bank report on Sierra Leone’s infrastructure said the current fuel levy is not sufficient to cover maintenance, or extensive rehabilitation of roads. To complete road rehabilitation in a five-year period, Sierra Leone would need to raise fuel levies and improve the transparency and fairness of the tax, while still relying on donor and governmental finance, the report said. Sierra Leone would also need to provide better access to its main airport at Freetown, currently reachable only by ferries. Addressing Sierra Leone’s infrastructure challenges will require a sustained expenditure of $258–478 million per year. 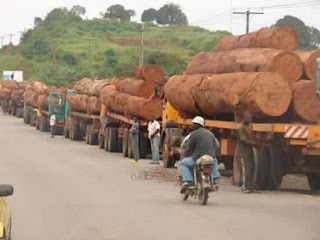 The report considered only public infrastructure needs without taking into account the private infrastructure needs of the concessions associated with the mineral, forestry, and agriculture industries. Water, transport, and power have the largest weight in this overall price tag. Although the $258–478 million per year cost looked daunting relative to the 2009 GDP of around $1.9 billion, it is less so relative the country’s vast mineral and natural-resource wealth, World Bank experts wrote. In recent years, Sierra Leone has been spending some $134 million a year on infrastructure when all sources public and private, budget and off-budget are borne in mind. This is equivalent to 10 percent of GDP—an average level of effort compared to other African countries. Back at Tower Hill, Keita assured the Parliamentary Committee that his company would soon complete the Kabala and Kono road works. Chairman of the Committee on Works, Housing and Infrastructure, Hon. Komboh Kamara, asked contractors to speed up because most of the road works were going at a snail pace. The Committee plans to pay oversight visits to assess road projects in a few weeks.